It is two days before Christmas, and I suspect you have much better things to do than read lengthy blog posts. So, I will take this opportunity to wish you the best for this holiday season. 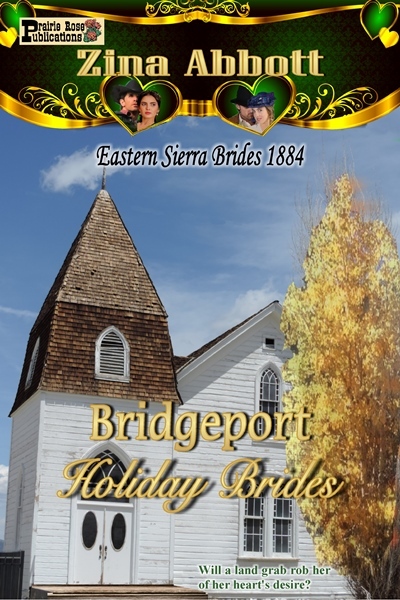 I hope you have enjoyed reading my Eastern Sierra Brides 1884 series this past year. If not, whether you are using your trusty old Kindle or receive a brand new one for Christmas, I invite you to take a look at these sweet romance novellas. 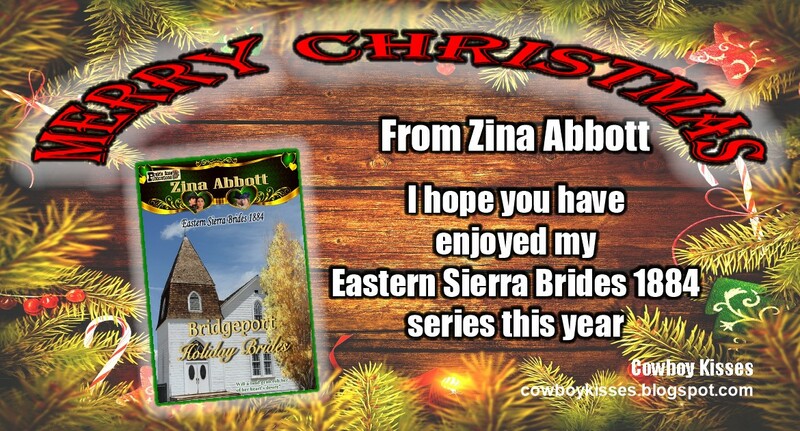 You may find all my Zina Abbott books by CLICKING HERE. Click on the "follow" link on my Amazon Author Page to be notified when my new books are published in 2017. 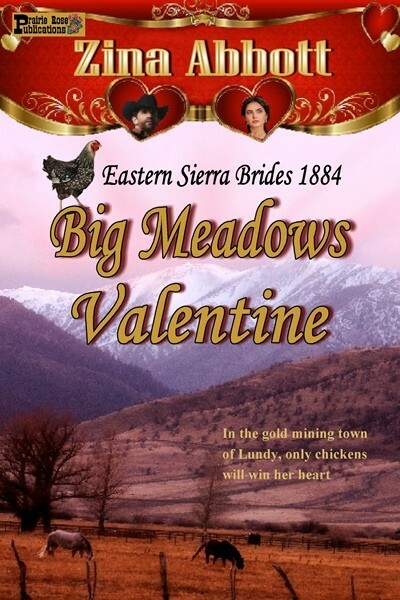 In the gold mining town of Lundy, only chickens will win her heart. 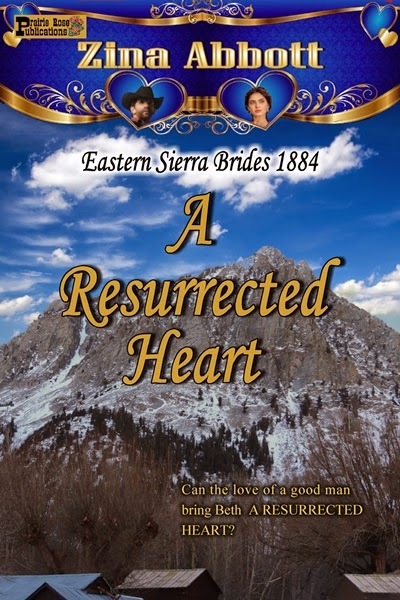 Can the love a good man bring Beth A RESURRECTED HEART? 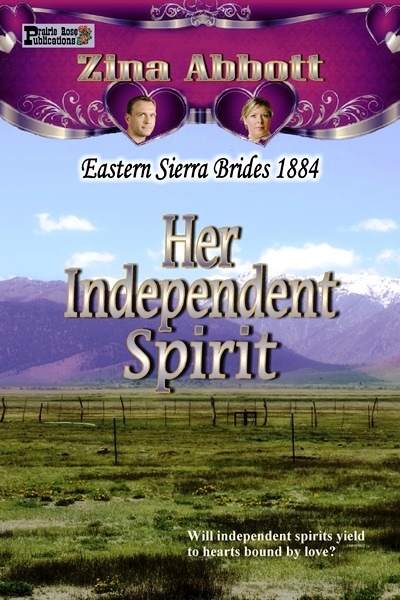 Will independent spirits yield to hearts bound by love? No matter who haunts him, he will win her heart. Will a land grab cost Beth her heart’s desire? “On November 13th it started to snow and continued almost solidly for nearly thirty days. The reduced number of punchers had trouble getting feed out to the increased number of winter cattle, and after what had been a very dry summer, the grass under the snow cover was virtually gone. Cattle were dying off, the fat on the steers disappearing almost by the day. Then, around the end of the first week of December, there was milder weather and a thaw began of the deep lying snow. Rose managed to get back from Chicago at last, and Christmas festivities were planned in the belief that the crisis was over. But on Christmas Eve it started to snow again. Oliver and Alex were left alone while the men were sent out to trail-feed the cattle that followed each other and huddled to stay warm. As the days went by, thawed slush turned to solid ice as the temperatures dropped to minus 30. Horses plunged after the cattle in the deep snow, their legs cut and blood freezing on their coat as soon as the wounds opened. Cattle feed was buried and the herd started drifting with the wind, walking and lowing, bawling, with empty stomachs and nothing more to eat than underbrush, bark from the few trees, lower branches and twigs if they could find them. Hair wore off their legs to the hocks and soon it was hide peeling off from frostbite. Tails froze like icicles and snapped off. In many cases, their hooves froze and dropped off and they limped on with hoofless stumps while others became encased in the solidifying crystals and unable to go further. Those endless plains, which Alex had so admired, now proved deadly with their lack of woodland, and the snow eddied and swirled into a great emptiness. In January there was a three day blizzard and on the 14th the temperatures plummeted to forthy-seven below. Alex was frantic for Jesse whom she hadn’t seen now since before Christmas Eve, and also worried for the Yosts in their much smaller home. Firewood and coals were running out as was food and she tried to keep herself busy with endless sketching rather than watch Oliver pacing the floor and shouting at everyone every time he was asked a question. In late January a Chinook started, melting the top layer of the crusted snow. Yet the winter was not over and it turned cold again, and on the third of February another two day blizzard started. The feed sleighs were practically useless now. So now that you know how lucky you are home and in front of your lovely fire or enjoying the warmth of central heating, let’s back-track a little. In the 1880s, the cattle industry was predominantly run by large British companies who depended on open range—grazing land that they did not own. The exceptions to this premise were few, and included the famed Matador Company, Scottish run, which still exists today. They believed in land-owning and it saved them. But others did not and, in addition, they took a gentleman’s word as to number of head of cattle and used what was called ‘book count.’ If a man told you he was selling you two thousand head of cattle, by gum, that’s what you put in the book. You didn’t do a head count and check him because you took a man’s word for it. 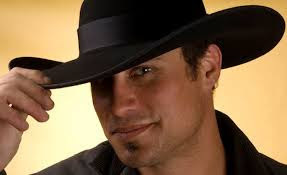 So now comes along this devastating winter, a winter in which it was said you could walk on the carcasses of cattle from Texas to the Canadian border. A winter that wiped out approximately 60-75% of the livestock, never mind the human loss. And while the barman at the esteemed Cheyenne Club may have quipped, ‘Never mind, boys, the books won’t freeze,’ the Club itself would soon close with the loss of the cattle barons who supported it. The winter of 1886/87 changed the West forever. The large cattle companies mostly closed down, bankrupt, and homesteaders and small ranchers slowly moved in. Eventually this would lead to conflicts like the Johnson County War. Ranchers now knew they had to increase their provision of winter feed. 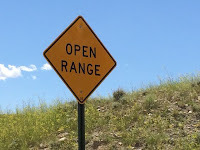 But mostly it marked the end of Open Range as the predominant method of providing grazing for livestock; barbed wire sprang up all over the West as the smaller ranches proliferated. So while you’re sitting under that Polar Vortex and roasting a marshmallow or two, give a thought to the ranchers out there who never get ‘snow days,’ whose livelihood depends on getting their herd through winter.